This month brings some real pieces of hobbies and pastimes of American life. How lovely! 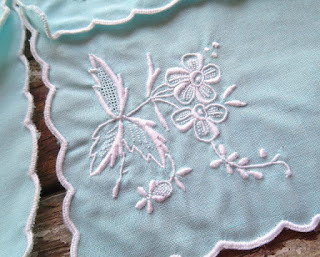 This bridge set of napkins and rare, cocktail glass slippers are a perfect shade of robins egg blue with white embroidery. These are on sale, too! Also, I love this vintage Brass Butterfly plant rooter; also a good home for air plants! And, this! A vintage tennis racket with a cross stitch yarn heart. 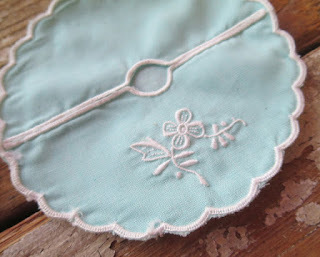 I actually did a tutorial a few years ago on the blog and I'm letting go my demo. Instant art! All of these items (and more) are located in my dedicated Etsy shop. 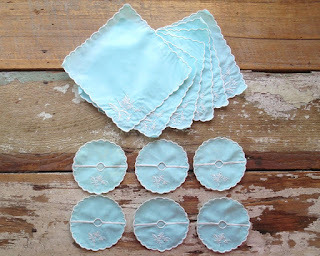 Vintage Cocktail & Bridge Napkin Set - on sale here. Forty Love Vintage Tennis Racket with Cross Stitch Heart - get the original here. We end this month full of thanks! This past Saturday was our big Anniversary Celebration and Sale. Despite a terrible rainstorm with hail (yes, hail, yes! ), we had an incredible turnout! We are already planning our 10th anniversary and next year will be BIG! Thanks again for shopping and supporting our store! Remember, you can still use your coupon code HAPPY15 for 15% Off any purchase at our Etsy shop in celebration, too! This is a BIG weekend for us! We're celebrating NINE years in business at our Ponchatoula, LA location. And as a big thank you we've got some great one day specials for this Saturday, March 25th. First off, we are offering this amazing little tote (designed and silk-screened by moi!) 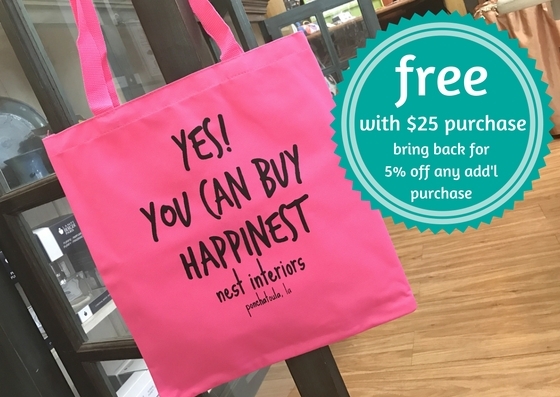 free with a $25 purchase in store...but wait there's more...when you bring this bag back and let us fill it with more awesomeness...you get 5% OFF any additional purchase forever! Secondly, Saturday only, the store is 15% OFF everything, I know, crazy right??? And right now, we've got so much new stock: Easter decor, flags, a full restock of Lampe Berger, amazing regionally made items. This is going to be a good day to have a GREAT day! Thirdly, I know more?!? I'm hauling in bunches of mini cupcakes and sweet tea, just so you know how much we love you! This is primarily an in-store celebration, but our Etsy shop (also NINE) is running a special coupon code HAPPY15 for 15% off your entire purchase there! And thanks from the bottom of our hearts, for making our shop dream a reality! It was such a delightful experience; one of those rare times that something actually exceeds all your expectations. The highlight for me was walking into their "bog area" - it sounded rather unattractive by name, but it could not have been more magical...an open area, with a field of tiny almost Chinese lantern style blooms, and bright yellow and red pitcher plants poking up through the grass. Small pearl crescent butterflies zipped past, drawing my attention to a dive, then another, of a pretty bluebird pair...all of which were none too bothered by two loud toddlers...thankfully! Find out more about Crosby Arboretum and the work they are doing in the field of native planting here. Is Easter really on our heels?! 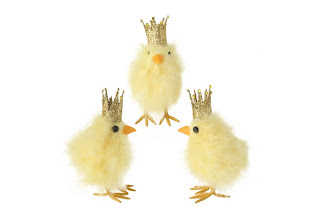 Yes, I think for sure as fluffy bunnies, cute chicks and glittered eggs surround me!